The O'Neill family were part of the mid-Antrim gentry. They owned Shane's Castle on the southern borders of mid-Antrim. Sir Arthur, born in 1876, was a veteran of the Boer War. He was elected as a Unionist Party MP in 1910. He was anti-Home Rule and, along with Sir William Adair and the Youngs of Galgorm Castle, played a key role in the establishment of the local Ulster Volunteer Force. His military background was invaluable in establishing drilling and training regimes for recruits. As a Captain in the 2nd Life Guards regiment he served in the First World War. He was killed very early on in the conflict in November 1914 and was the first serving MP to be killed in the war. 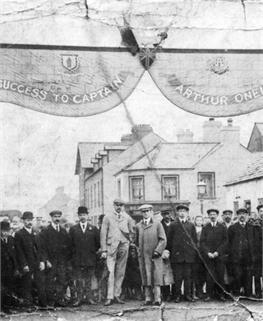 Arch in Henry Street, Harryville, erected to support Captain Arthur O'Neill in his campaign for election to Westminster in 1910. Capt O'Neill can be seen in the centre and George Young is the tall man beside him. What clues can you see on the banner that show O'Neill was a Unionist?